Choose from a wide range of protective pads manufactured from 50mm thick high impact foam covered with washable PVC. These fire retardant protectors may be used both internally and externally to cover and protect posts, columns and vulnerable corners of buildings. Used within school premises they help to provide a safer environment for playing children. Manufactured to order to your size(s). Available in square, rectangular and round formats. Popular height is 1.5m – with other sizes available. Please note the maximum recommended height is 2m as after this the pads tend to bow. Should you wish to order 4m (maybe providing protection on an overhead beam) we would advise ordering 2 off at 2m each. Quick and easy for anyone to fit using Velcro fasteners. Eyelets are avaiable as an option. Please specifiy this when ordering. Wide range of colours to choose from – colours may be mixed within one order. Delivery is approx 3-4 weeks from order placement. We will ensure that delivery will not fall within a holiday closure period as the protectors need to be signed for upon receipt. Special ‘U’ and ‘L’ shaped post protectors are available fixed with self-adhesive Velcro, eyelets or Velcro straps depending upon the exact position of the posts adjacent to walls. Please ring us for details. All Post Protectors are custom made to your measurements and cannot be returned unless there is a specific fault with the protector itself, so measuring your post may feel like a lot of responsibility. The following guide should help you successfully measure your post correctly so you don't order the incorrect pads. .
Square or Rectangular posts: When measuring a square or rectangular post, we would require the measurement of atleast two faces i.e. 100mm (face1) x 100mm (face2) for square OR 100mm (face1) x 200mm (face2) for rectangular. Circular posts: If ordering Cylindrical Post Protectors through our website, please ensure when measuring that you are measuring the Circumference (the measurement all around the post) and not the diameter (the measurement across the post). If you’re not confident in converting from diameter to circumference, please let us know and we will convert it for you. Posts with downpipes: In this instance, we would supply a rectangular pad to fit around the perimeter of both the post and downpipe. We ask for the overall size of the shortest and longest length. If you are still unsure about measuring your posts, please contact us via email or telephone. Available Post Protector colours as below. Colours shown are for illustration purposes only and may not accurately match the actual finished product colour. Fluorescent colours are recommended for indoor use only due to discolouration after time and exposure to UV light. Carrying out an internet search for some suitable post protection for our Sports & Classic car showroom, I was fortunate to come across a local company 'Birchwood Trading' and the bespoke items were ready for collection within 3 weeks of placing the order. We are very impressed with the product which is high quality, with a fit and finish which matches our showroom perfectly and all for a very reasonable price. Thank you for a fantastic product and service. A very good product , does exactly what we need to stop cars being damaged against concrete posts. very high quality and worth every penny . Very good product ordered 4 custom made padded post protectors delivered within 1 week ready for the new school term to stop anymore accidents!! Easy to install with very strong velcro to keep in the right place also very easy to use web site for pricing etc. Reviewed by J Rose - West Chiltington. Excellent design and material quality that should stand the test of time and hoards of children. Smart in appearance and practical too. Excellent, friendly and prompt service. 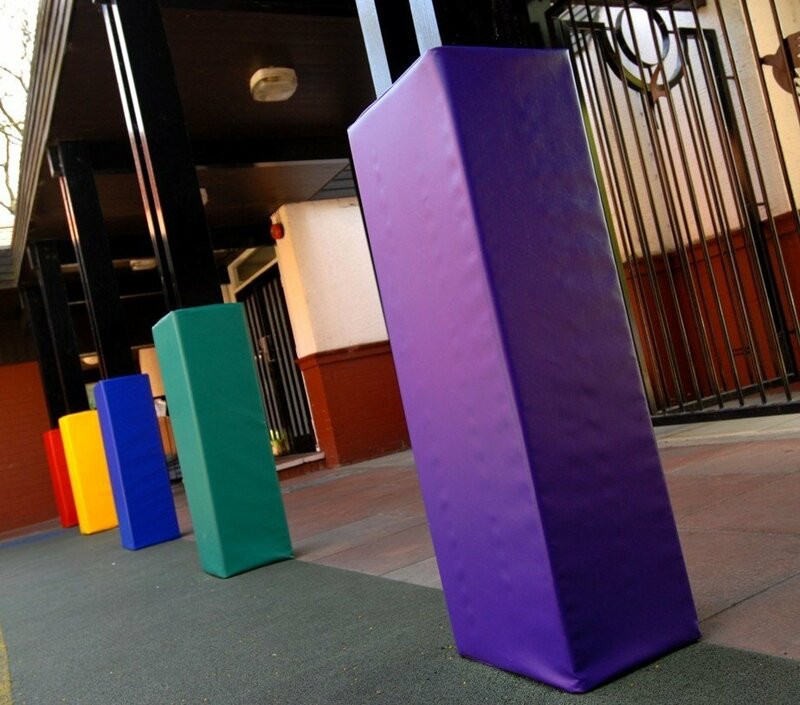 The coloured post protectors look great in our early years garden area. Good quality product - we would look to use you again. Friendly, prompt and reliable service. Able to accommodate awkward sizes - would definitely recommend! Excellent value for money. Very fast and efficient service, very helpful and the finished post covers look great! Very good customer service. Good price and very good quality. We needed the post protectors to ensure our Pre-school children did not hurt themselves on the canopy supports. The product does exactly what we need it too and looks good at the same time!